The huge cupola of the Our Lady of Lourdes Basilica is hard to miss while walking through the peaceful neighborhood of Quinta Normal in the western area of Santiago de Chile. Just in front of the temple lays a street market of a particular kind. Street markets are common in Santiago. Some of them are permanent, while some others come up during specific days for a couple of hours and then vanish. Vendors set up tables and plastic roofs and sell the most varied merchandise: fruits, shoes, books, vegetables, bags, fish, used electric devices, clothes and plastic containers. Vendors cry out their offers and some of them even sing. The merchants in front of the temple, however, sell a quite distinctive paraphernalia, more in tune with the ambiance of the place. Yellow candles, brown crucifixes, grey statues of saints, blue bottles for holy water in the shape of the Virgin Mary, red bracelets and pink quartz stones lay next to each other in colorful contrast. Their colors are as varied as their purposes: specific saints (or stones) heal specific ailments or protect against specific evils. The diversity of this pantheon does not distract from what is beyond the market: the impressive open-air temple of the Lourdes Grotto. 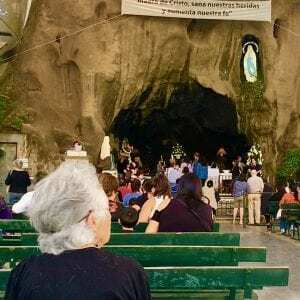 This open-air temple, built in the late XIX century, hosts a reconstruction of the Lourdes Grotto, the cave in France where, according to Catholic tradition, the Virgin Mary made a series of apparitions to the 14-year old shepherd Bernadette in 1858. A series of minor displays to the left and to the right of the major shrine tell the story of Bernadette and her many encounters with the Lady. At the center, in the main shrine, a statue of Bernadette can be seen to the left. If you follow her gaze upward, you will find a statue of the Virgin Mary next to the words “Mother of Christ, heal our wounds and increase our faith”. For a couple of hours the shrine is open and people are invited to go in and touch the rock. While a lady at a pulpit reads the story of the apparitions and prays to Mary, people come to the front, piously caress the feet of Bernadette, touch the cave wall behind the altar and then reach a holy water font, where they wet their fingers and make the sign of the cross on their foreheads. Even though there were people of varied ages, most of them were over fifty years old, not few of them over seventy years of age. They came, they sat for a while and, if the shrine was open, they would go to touch the statue and the wall. To the left of the shrine there is a spring of holy water. People queue –some standing, some on crutches, some in wheelchairs– to bless themselves or to gather the holy water in bottles, a few of which had the shape of the Virgin. The walls demarcating the area temple are covered with marble plaques, of which I counted over 2.000. Some of them as small as a packet of cigarettes, some others as big as a magazine. Some of them ask for help for a specific individual or family. Most of them thank the Virgin of Lourdes for the received favors. Some are as anonymous as to use the initial letters of names, while others have pictures of the beloved person for whom healing or care is asked. On the marble surface further requests and gratitude notes are written in pencil. The newest one was from last month. The oldest one from the first decade of the 20th century. For over a century people have come to this shrine to ask for divine help against disease or unemployment and to express gratitude later on. The high number of elderly people is remarkable. Was it always like this? Did these devoted citizens also come when they were younger? Does religious devotion increase with age? These are some of the questions related to the experience of ageing, healthcare and spirituality I want to answer in the frame of the ASSA project.